Important things to do before tying the knot! We all know there is so much involved with planning a wedding. The dress, decor, your venue, and vendors. But wait… There’s more, you marriage license! An item on your to-do list that cannot be forgotten. Depending on your County, it can be used right away and must be used within 90 days. Follow the link below to apply and click on “self service” to submit your online application. 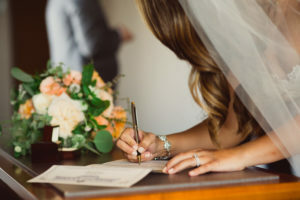 Are you choosing a family member or friend as the officiant for your wedding day? A one day deputy commissioner is an option. Find your local County Clerk-Recorder’s office. Here’s how to apply.